BEDFORD, MA -- The East Coast Wizards get back to work this week, after a short ten-day break following the January Showcase. The Wizards swept the final league-wide event of the season, and improved to a perfect 6-0-0 so far in 2019. The schedule begins to intensify from here however, with matchups this week against the Connecticut RoughRiders and the New Hampshire Avalanche. "It wasn't a particularly long break, but it came at a good time for our guys," said Wizards head coach and general manager Freddy Meyer. "We had just finished a stretch with four games in six days, and Kory [Falite] and I continue to feel impressed with the way this group has come together." 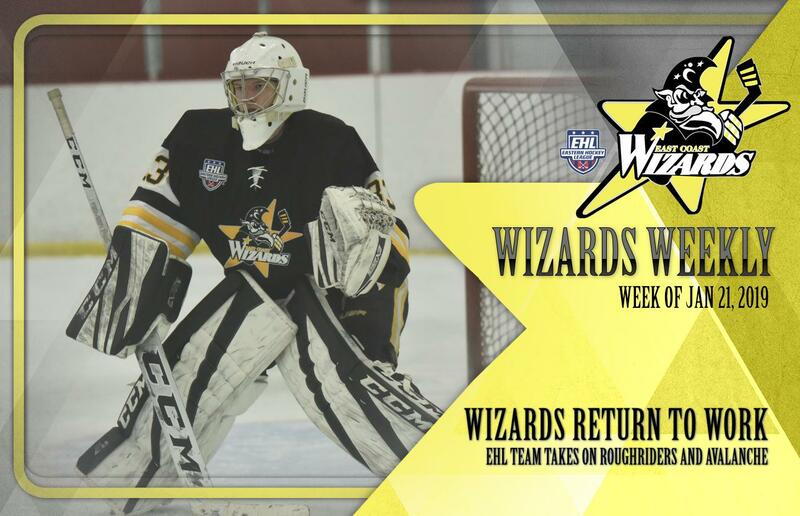 After sweeping a pair of games with the New Jersey 87s at the beginning of the month, the Wizards followed things up with wins over the Valley Junior Warriors, Connecticut Chiefs, North Carolina Golden Bears, and Team Maryland. The stretch has helped the Wizards close the gap on the Seahawks Hockey Club at the top of the division. Looking ahead to this week's games, the Wizards will start things up on Thursday with a 12:30pm puck drop down in Norwalk, CT. The matchup with the RoughRiders is the third of the season, after the two teams split the pair of meetings back in mid-October. Connecticut won the first contest 4-2, and then the Wizards turned the tables with a 4-1 victory the next day. Flipping over to Friday, the Wizards will host the New Hampshire Avalanche for the second and final regular season meeting between the conference rivals. New Hampshire will come in seeking revenge, after the Wizards shut them out with a 4-0 win back on December 7th. The victory snapped the current Avalanche winning streak at 16 games, and it was the first time the defending champions had been shutout in over a year. "Each of our opponents will be looking for some revenge this week," added Meyer. "We have to find a way to use that to our advantage, and continue to build off of the momentum that we've established this month." If you can't make it to a game, you can catch the action live on HockeyTV. Also, be sure to follow the Wizards on Twitter, for updates throughout the rest of the regular season.